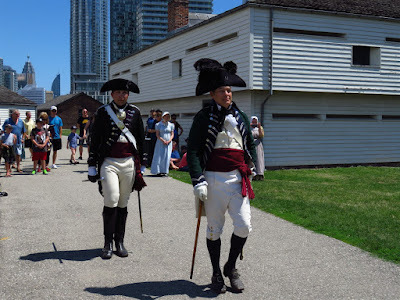 This afternoon, Teena and I walked over to Fort York for Simcoe Day activities. Ontario cities and towns have today off as part of their Civic Day holiday weekend. In 1968 Toronto named this weekend after John Graves Simcoe, who was the founder of Toronto. Simcoe also ended slavery in the Canada's, although with some limitations in 1793. Here is a view looking eastward towards the fort and the city behind it from the military graveyard. This is a lookout behind the new Fort York visitor centre where there is an excellent view of the fort and city. The Battle of York was fought from just west of and across the Exhibition grounds. Old and new. An 1812 cannon in front on newly built condos. The entrance to the fort with the fort behind. The Blue Barracks to the left and centre blockhouse. The magazine which was built in 1814. An officers room. Those boots look quite heavy! The officers' dining room. Officers seem to have it rather good. This is the first time I have seen the basement open. Here is the original cooking fireplace from 1815. Down here too are two rooms built in 1837 to store and protect the money held by the Upper Canada Bank in Toronto. There were dance demonstrations. A short dance lesson followed. There was a military march and drill presentation. The soldiers were of all ages and they all looked like professional soldiers of the period. Well done! The sound of 50 bayonets being slapped onto the tips of their muskets at the same time, sent shivers down my spine. The drum and fife corps. Here come John Graves Simcoe himself to give a short declaration and inspect the troops. This was so cool and so loud. They did not fire their muskets at once but do so one, right after another, left to right, all the way done the line ending with a blast from the cannon. It only only took about fifteen seconds to complete. Afterwards they marched off in formation. The second magazine (left) and eastern barracks. It was the first time I had been in the brick magazine, which inside show cases the battle of York on both floors. A cannon protects the fort from the encroaching city. It was a fun day at the fort. Originally I was going to do something else and Teena suggested we hit the fort. I always have a fun time there and next year I would like to go for Simcoe Day again.